Outlined in our Signature Stats Spotlight, pass-blocking efficiency has been talked about since we at Pro Football Focus started tracking every player on every play of every game. Effectively measuring pressures allowed on a per-snap basis, here is how all 32 NFL teams stacked up last year in terms of PBE. 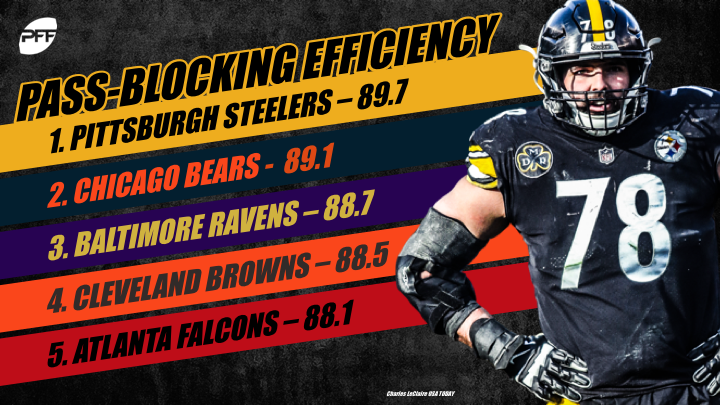 It’s no secret that the Steelers’ offensive line has been one of the league’s most dominant units over the last couple of years, so it comes as no surprise to see them top this list. Through 17 weeks, the unit allowed only 136 pressures on the year (13 sacks, 20 hits, and 103 hurries) despite playing the league’s second-most pass-blocking snaps. No team surrendered fewer pressures last season than the Chicago Bears, who allowed 117 from their 519 pass-blocking snaps. They ranked second among offensive lines in sacks allowed (11), fifth in hits allowed (14), and third in hurries allowed (92). The Ravens finished the 2018 regular season with a pass-blocking efficiency of 88.7, as they surrendered 129 total pressures on 606 passing plays. They allowed only eight sacks on the year, which ranked first among teams, while their 25 knockdowns (hits + sacks) allowed ranked second only to the Browns. With high-priced free agents at center, right guard, and right tackle, the Browns gelled into one of the best pass-protecting units in the entire NFL. They allowed 15 sacks, seven hits and 110 hurries from their 638 passing plays, while they ranked first among teams in total knockdowns allowed (22) and snaps played per knockdown (29.0). The Falcons’ offensive line took a big step forward in 2018 and allowed 140 total pressures from 676 pass-blocking snaps on the year, a marked improvement from 2017 when they allowed 148 pressures from 568 passing plays. 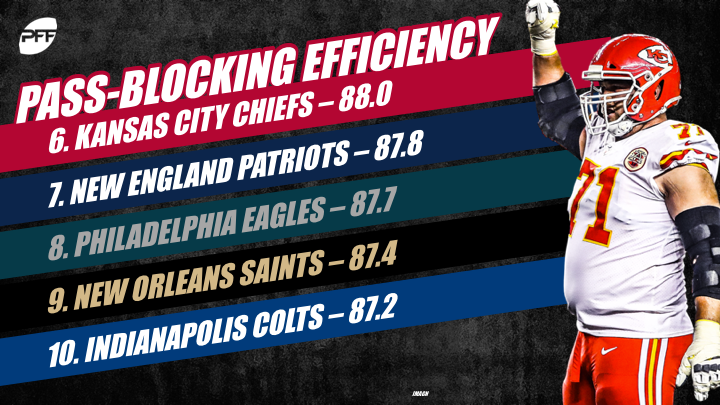 With the help of one of the best tackle duos in the NFL, the Kansas City Chiefs allowed 141 total pressures from their 641 passing plays in 2018 but allowed just 13 sacks on the year, which tied with the Rams and the Steelers for the fourth-best mark among teams. As we’ve come to expect from Dante Scarnecchia’s men, the 2018 edition of the Patriots’ offensive line was a well organized, highly-efficient unit. Guard Shaq Mason finished the season as PFF’s All-Pro right guard and all five starters were among the top-75 graded offensive linemen in the league. All told, they allowed 12 sacks, 34 hits and 88 hurries from 598 pass-collective pass-blocking snaps. Once again, the Eagles still fielded one of the best pass-blocking lines in the league. Jason Kelce was the top overall graded center, while both Brandon Brooks and Lane Johnson were top five at their respective positions – and they combined to allow 14 sacks, 26 hits, and 106 hurries on their 653 passing plays. Their pass-blocking efficiency of 87.7 is the team’s best mark since 2008. The New Orleans Saints fell to ninth place a year after they finished first on this list thanks to subpar play along the interior and the injury that forced stalwart tackle Terron Armstead to miss the second half of the season. From 547 passing plays, they allowed just 124 pressures, the second-fewest among teams. Before the 2018 season, the Colts had two main priorities. Priority number one: Get Andrew Luck back to his 2016 form. Priority number two: Fix the offensive line so he could stay on the field. Through 17 weeks of the 2018 season, they succeeded in doing both. In their 16 regular-season games, the Colts’ offensive line, a unit once ridiculed for their inability to protect the face of their franchise, allowed only 132 pressures on their 573 passing plays and tallied a cumulative pass-blocking efficiency of 87.9, which is by far the best mark of the Andrew Luck era. Most importantly, the line allowed only seven sacks on the year, a marked improvement considering they had averaged over 20 sacks allowed per season from 2012 to 2016. After a blazing hot start, the Rams offensive line came back down to earth over the second half of the year. 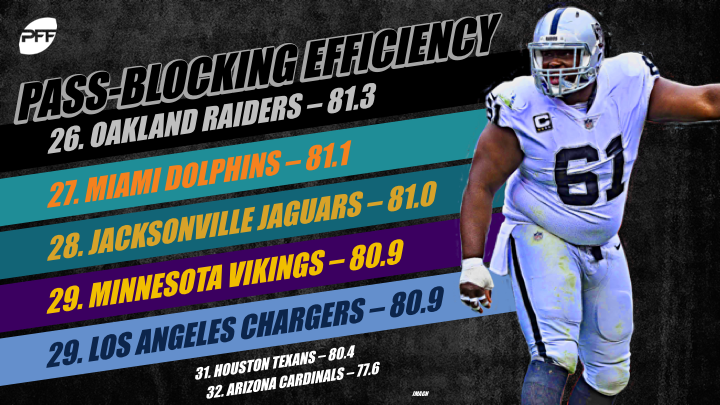 They ended the regular season ranked 11th among teams with a pass-blocking efficiency of 86.5 after they allowed 13 sacks, 24 hits, and 116 hurries from their 617 passing plays. 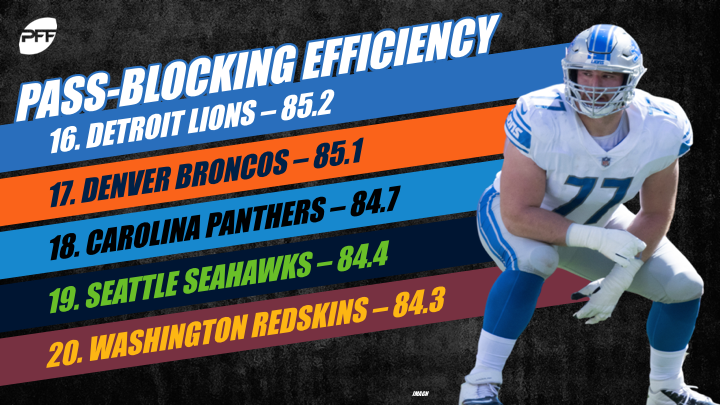 A year ago, after the Bills finished second among offensive lines in pass-blocking efficiency, we spoke about how difficult the losses of Eric Wood, Richie Incognito and Cordy Glenn would be to overcome. That rang true throughout the 2018 season, where they allowed 154 total pressures from 595 passing plays, a year after they allowed just 124 pressures from 569 passing plays. Green Bay had their issues along the interior, but it’s hard to overlook the fact that they sent out the best pass-protecting tackle duo in the league last year. Left tackle David Bakhtiari had the highest pass-blocking grade among all tackles while Bryan Bulaga ranked second among right tackles, and it’s a huge reason why the team allowed just 179 pressures from 729 passing snaps. In 2017, the Tennessee Titans averaged 18.4 pass-blocking snaps per knockdown allowed, which ranked first among the league’s 32 offensive lines. In 2018, they kept up the good work by allowing a knockdown once every 20.0 pass-blocking snaps. As a unit in 2018, they allowed only six hits all year and ended the season charged with 131 pressures from 519 passing plays. Heading into 2018, the Jets’ offensive line was correctly pegged as an underwhelming unit that was made up of average-level veterans. At the end of 2018, they met expectations. They allowed 17 sacks, 19 hits, and 115 hurries from their 581 passing plays in 2018. What had the makings of a promising offensive line fell apart quickly in Detroit. Veteran guard T.J. Lang only managed 282 snaps before ending up on IR, while Frank Ragnow allowed the 10th-most pressures of any guard in the league. As a unit, they allowed 165 pressures from 628 pass-blocking snaps, and they ended the year ranked 16th among offensive lines in pass-blocking efficiency. After struggling for some time along the offensive line, the Broncos’ 2018 unit got off to a great start. Over the first two games, they allowed just one sack, two hits, and five hurries from 77 passing plays, and their pass-blocking efficiency of 94.2 ranked second among teams in that span. However, it wasn’t meant to be. After a hot start, the Broncos had crumbled to a pass-blocking efficiency of 85.1 by the end of the regular season, after they allowed 173 pressures from their 632 pass-blocking snaps. Things could have gone so much worse for Carolina when you consider the fact that they lost both starting tackles before the season even began, so the fact that they’re in the middle of the pack here is quite an achievement. They allowed only 16 sacks, 21 hits, and 138 hurries from their 626 passing plays, and the star of the show was none other than last year’s second-round pick Taylor Moton, who allowed only four combined sacks and hits all season long. The Seahawks ended the 2014 season ranked 22nd in this metric. They ended the 2015 season ranked 27th, the 2016 season ranked 29th, and the 2017 season ranked 26th. So, the fact that they finished 19th here in 2018 should bring nothing but hope for Seahawks fans. After averaging over 200 pressures allowed per season from 2014 to 2017, the 2018 Seahawks allowed just 132 from their 502 passing plays. In what has started to feel like an annual occurrence, injuries decimated Washington’s offensive line last season. 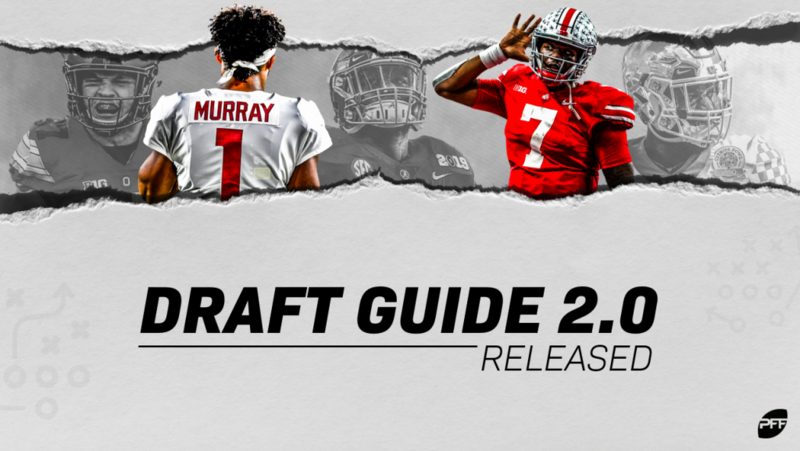 By the end of the year, eleven different players had played at least 25 pass-blocking snaps, and those players combined to allow 167 total pressures on the year, including 36 quarterback hits – the fourth-most among teams. On paper, the Redskins have one of the better outfits in the NFL, but they simply need to stay healthy going forward. No offensive line allowed more quarterback hits than the Bucs last year (43), while only the Arizona Cardinals allowed more knockdowns than the Bucs’ 68. That’s not a good recipe for success in terms of pass-blocking efficiency, so there’s no surprise to see them at number 20. Oh, how the mighty have fallen. Four seasons ago, the Cowboys’ line was in the discussion for being among the best to ever walk out on to a football field – but pieces have drifted away one-by-one over the years until Tyron Smith and Zack Martin were the only ones left. The Cowboys allowed 26 sacks, 23 hits and 120 hurries on 612 regular-season passing plays in 2018, and that resulted in a pass-blocking efficiency of 84.1 – their worst mark as a team since 2012. Impressive performances from tackles Mike McGlinchey and Joe Staley did a great job of masking the underwhelming play of the interior. Mike Person and Laken Tomlinson combined to allow as many pressures (65) as their tackle duo did, while center Weston Richburg gave up the third-most pressures of any center in the league (33). The Niners ended the year having allowed 175 pressures from their 593 pass-blocking snaps while allowing the league’s third-most quarterback hits. The Bengals signed left tackle Cordy Glenn and drafted center Billy Price in the hope that they could come in and fix a troubled offensive line, but both came in and fell victim to what might be a cursed unit. While they did a relatively good job of keeping their quarterbacks upright (26 sacks and 13 hits allowed), they averaged just 4.4 pass-blocking snaps per hurry allowed – a mark that bettered only the Cardinals, Vikings and Texans. The big-money deal for Nate Solder did little to improve a unit that finished 20th in this statistic a year ago. Continuing a problem that has been with the Giants for a while now, the Giants’ offensive allowed the sixth-most pressures among teams (190), including the fifth-most quarterback hurries (139). The decline of this Raiders unit has been cataclysmic. After finishing the 2016 and 2017 seasons respectively ranked first and fourth among teams in this statistic, the Raiders avalanched to 26th last season thanks to the 185 pressures they allowed throughout the year. There were some bright spots, like the continued pass-blocking excellence of Rodney Hudson, but the play of their tackles (who allowed 120 pressures between them) was ultimately far too much to overcome. Their 43 sacks allowed was the worst mark by an offensive line since 2012. After Josh Sitton went down early, things went from bad to worse for the interior of the Dolphins’ offensive line. Jesse Davis, Ted Larsen, and Travis Swanson combined to allow 98 pressures on the interior, and as a unit, the line allowed 169 pressures from their 520 passing plays. Their average of 8.8 snaps played per knockdown allowed was the league’s second-worst mark. After finishing in the top 10 last in 2017, the Jaguars slipped all the way down to the bottom five in 2018. The Jags tied with the Texans for the fourth-most total pressures allowed among teams, and they finished behind only the Raiders (43) and Cardinals (34) in sacks allowed, with 33. In 13 years of grading games, the Chargers have finished in the top half of this list just once. Once. And even that was back in 2006. The latest episode of the Chargers’ calamitous pass blocking culminated with the surrender of the league’s ninth-most sacks, sixth-most hits, and 11th-most hurries. The Chargers won’t have Philip Rivers forever, and the quicker they realize that, the better. Competent offensive line play is difficult to find in the NFL, and no team exemplifies that more than the Houston Texans, who have now surrendered 200-plus quarterback pressures in three consecutive seasons. It may not have been as bad as last year (where they allowed 253 pressures), but they still allowed 31 sacks, 32 hits and 150 hurries from their 623 passing plays. To say that the Cardinals’ offensive line was in shambles would probably be too kind. They allowed the league’s second-most total pressures (218), the fourth-most hurries (142), the second-most hits (42) and the second-most sacks (34) all while they ranked dead last among teams in snaps played per pressure (2.6), snaps played per hurry (4.0), snaps played per knockdown (7.4) and total knockdowns (76). It can only get better from here.